Expand your portfolio with the latest subscription based visitor management technology on the market today. Partner with Gate Sentry to increase service and revenue with current clients as an added product line. Broaden your reach into new client opportunities, allowing you to promote your full product line. Fill out the form or give us a call to learn more! Become a Value Added Reseller Today! Keep clients happy with accurate and speedy visitor access. With computer based system processing can be 4-6 minutes per visitor. Gate Sentry processes returning visitors in less than 20 seconds and new visitors in under a minute. Gate Sentry makes the security team highly efficient in high traffic situations. User adoption of other web-based solutions is less than 30% With Gate Sentry user adoption is more than 75% because of mobile access and visitor notifications provided to users. Bring fresh solutions to existing clients and gain more new business with Gate Sentry. Share in recurring subscription based revenue stream. With licensed software and web-based solutions,network and power outages make the systems useless. 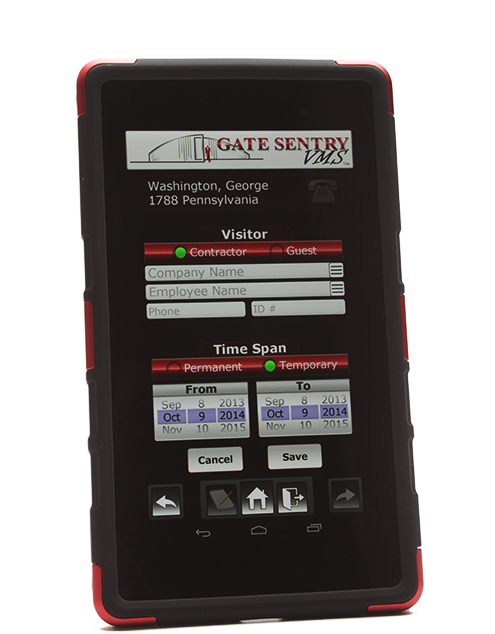 Gate Sentry is network independent and is fully functional in network and power failures. Eliminate the need for multiple hardware components and ongoing printing and maintenance cost with Gate Sentry. No equipment cost with Gate Sentry and lowest total cost of ownership in the industry. Leverage the customer “stickiness” a product like Gate Sentry provides. Residents become immediately sold on the benefits of controlling their own visitor lists and enjoying immediate notification of guest arrival. With contractor and guest databases in place, Security companies without Gate Sentry are at a competitive disadvantage. Gate Sentry offers marketing materials to support sales at every step of the process. Collateral drives lead generation,guides product demonstration and delivers comprehensive implementation including communications and training for both Security and residents.